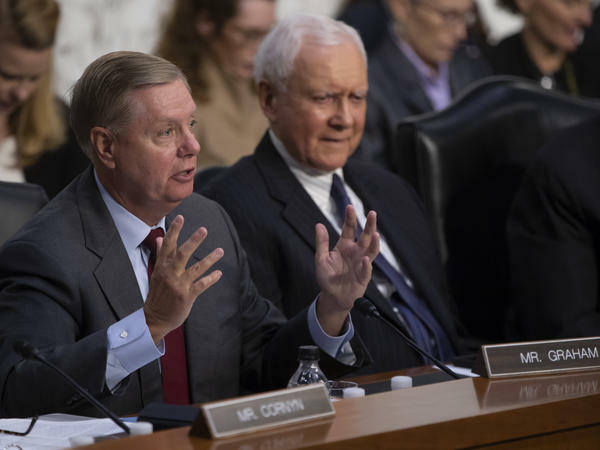 Sen. Lindsey Graham, R-S.C., joined by Sen. Orrin Hatch, R-Utah, (right) last week during questioning of Supreme Court nominee Brett Kavanaugh. Jackson A. Cosko of Washington, D.C., who identifies as a "Democratic political professional" on his LinkedIn page, was charged with making public restricted personal information, witness tampering, second-degree burglary, threatening interstate communications, unauthorized use of a government computer, identity theft and unlawful entry. Last week, Gizmodo reported that personal information for GOP Sens. Lindsey Graham, Mike Lee and Orrin Hatch of the Senate Judiciary Committee was posted online as the lawmakers heard testimony from Supreme Court nominee Brett Kavanaugh and Christine Blasey Ford, who has accused Kavanaugh of sexual assault. Information including home addresses, private cellphone numbers and more was reportedly added to the lawmakers' respective Wikipedia pages in a series of edits. Home addresses of politicians are generally public information, thanks to campaign filings, but their personal cellphone numbers are not. Screenshots of the personal information circulated throughout Twitter. Wikipedia tracks each edit a page receives on a public revision history log, including the edit's IP address. On his LinkedIn page, Cosko, 27, lists experience as a legislative correspondent and technology systems administrator at the Senate. He is also a graduate student studying cybersecurity policy and compliance at George Washington University's School of Engineering and Applied Science. Politico reports that Cosko was working as an intern in the office of Democratic Rep. Sheila Jackson Lee of Texas at the time of his arrest and that he has since been fired. Capitol Police say their investigation continues and that additional charges may be added.